This traverse begins and ends on the Grand Pass trail. Return to Obstruction Point may be made from Grand Pass on the trail past Moose and Grand lakes. An ice axe should be carried on this traverse. 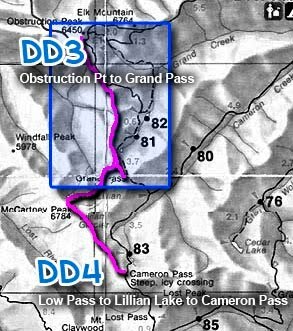 On the south end, this traverse can be linked with DD4 (Low Pass to Lillian Lake to Cameron Pass) where they intersect at Low Pass. See the published Climbers Guide for detailed approach information. Hike S on the Grand Pass trail about 2 miles to the place where the trail drops off Lillian Ridge to the E toward Moose and Grand lakes; a sign at this point indicates the way to the lakes. Proceed SW along the ridge top on the obvious way trail behind the sign. The trail quickly becomes rougher but is still quite distinct. Continue following this trail until it comes to a narrow, rocky spine at a point overlooking Moose and Grand lakes. A way trail traverses the N side of this spine until the third gully that descends the S side. Depending on how you descend the way trail, you may not see one of the gullies. If the trail seems to force you into the narrow crest of the spine, you have gone too far. Turn back and check out the last gully. This gully should reveal a faint trail traversing the top of the gully and passing above a small cluster of trees. Beyond the trees, a gentler slope leads down and W.
After passing beneath a small rocky spur, hike W and gently upward until you can climb up the broad couloir onto the NE ridge of Moose Peak. Hike S over Moose Peak, elevation 6753 ft. The top of Moose Peak offers splendid views. To camp here, be prepared to melt snow for water. From the summit, descend the broad SW shoulder. Once off the S slopes of Moose and back on Lillian Ridge, you come to a very nice sheltered campsite, just to the N of a rocky outcrop. From this campsite, descend W then S on a broad bench to Low Pass. Lillian Ridge is broad and flat topped here, with several campsites. From Low Pass, hike S along the E side of Lillian Ridge. After finding a way through the narrow Alaska cedar thicket, aim for the obvious notch directly S. The basin just above the notch provides very pleasant camps after midseason. In the basin above the notch, climb upward and SW along a rocky spur or on snowfields to gain the ridge top at Peak 6701. Follow a way trail E along the ridge top to Grand Pass.